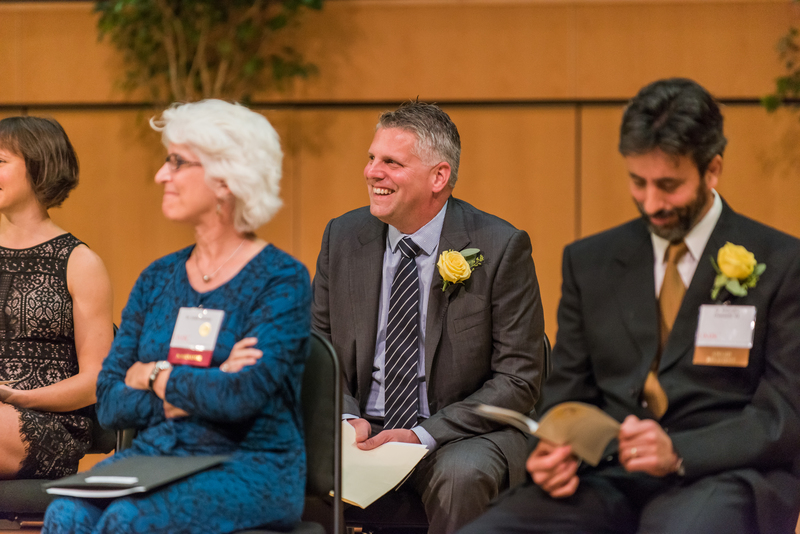 The UMBC community gathered for the 2017 UMBC Alumni Awards on October 5 in the Linehan Concert Hall to celebrate individuals who have made impressive contributions to society through their work. 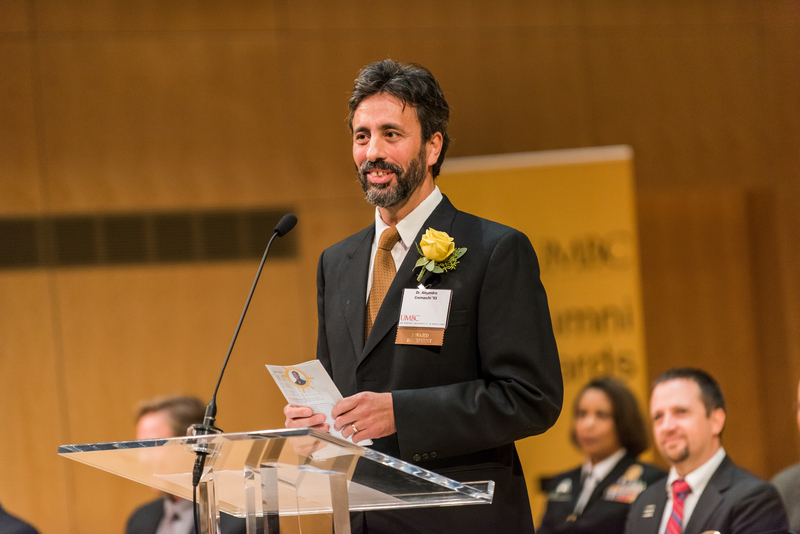 The UMBC Alumni Awards are held annually as part of Homecoming week, which welcomes alumni and members of the community back to campus for a range of events. This year, eight awards were presented to alumni and members of the community across all Colleges and from a range of disciplines. “I’m thrilled that the legacy of excellence embodied by these amazing individuals can be shared this evening and for many years to come,” said John Becker ’01, information systems management, president of the Alumni Association board. Kafui Dzirasa ’01, M8, chemical engineering, accepting the Outstanding Alumnus, Engineering and Information Technology award. Mark Marten, professor and chair of chemical, biochemical and environmental engineering, introduced Kafui Dzirasa ’01, M8, chemical engineering, calling him a “powerhouse,” mentor, teacher, motivator and life coach. “Our honoree is recognized not only for his research and scientific expertise but also for his compassion for his patients, and his determination to pay it forward to the next generation of young scientists,” said Marten. Today, Dzirasa is an associate professor of psychiatry, behavioral science, neurobiology, and neurosurgery at Duke University School of Medicine. He explains how he grew up in a family that was always “competing with integrity,” which helped shape him into the leader and person he is today. K. Dzirasa, who received the Outstanding Alumnus, Engineering and Information Technology Award, inspired the audience to “see one, do one, teach many.” Dzirasa’s two brothers also graduated from UMBC, including Delali Dzirasa ‘04, computer engineering, who received the 2012 Rising Star Award from the UMBC Alumni Association. 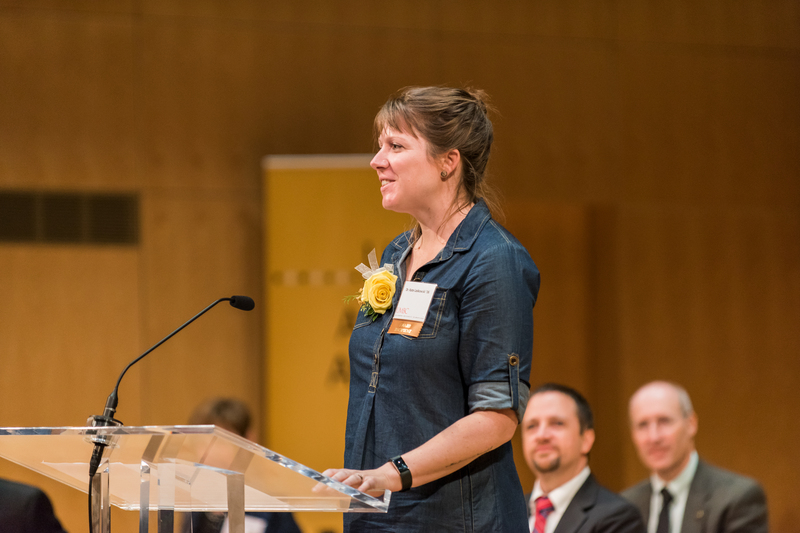 Kate Laskowski ’06, biological sciences and chemistry, received the Outstanding Alumna, Natural and Mathematical Sciences award. Laskowski stood out in a class of 350 students, recalled Leips. “She stood out as someone who was very engaged. Her curiosity, her need to know really stood out as an undergraduate,” Leips said. Because of this curiosity, Laskowski was one of the first undergraduate students to work in Leips’ lab, and she laid the groundwork for several Ph.D. and master’s students who came after her. 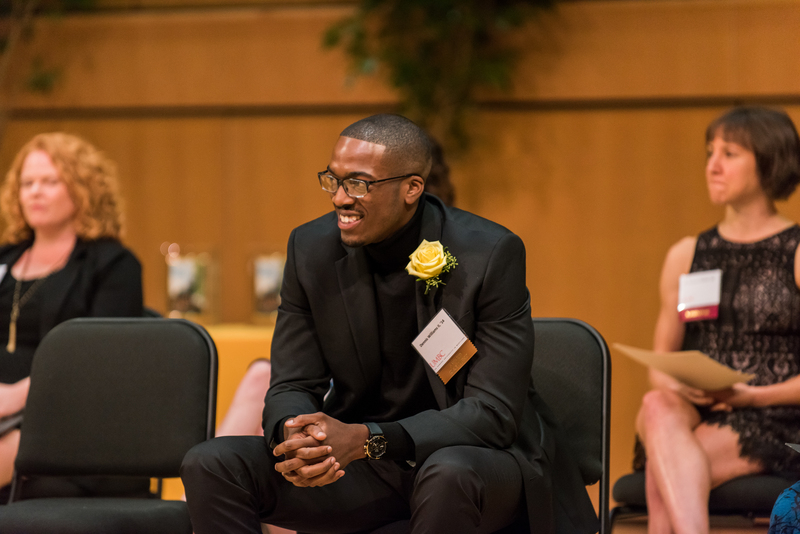 Dennis Williams II ’14, American studies, received the Outstanding Alumnus, Humanities award. Kimberly Moffitt, associate professor of American studies, introduced Dennis Williams II ’14, American studies, who received the Outstanding Alumnus, Humanities award. Williams is the head of content marketing for Skillshare, is an Oculus Content Fellow, and was named one of LinkedIn’s Top Voices in 2016. Moffitt said that Williams has “made a career out of storytelling.” Williams uses film to tell compelling stories about his life. “I found myself inspired by his determination, drive, and optimism,” Moffitt shared. Alejandro Cremaschi ’93, music, accepted the Outstanding Alumnus, Visual and Performing Arts award. Linda Dusman, professor and chair of music, nominated Alejandro Cremaschi ’93, music, for the Outstanding Alumnus, Visual and Performing Arts award. She explained that while Cremaschi was not one of her students, she enjoyed his performance at UMBC earlier in the semester that highlighted Latin American composers, and is inspired by his teaching style. “It was wonderful to see the artistry and pedagogical brilliance of this alumnus,” Dusman said. He recalls coming to UMBC as an international student from Argentina, and says that he “was very fortunate to find a lot of loving people and friends” at UMBC. Sylvia Trent-Adams Ph.D. ’06, public policy, accepted the Outstanding Alumna, Social and Behavioral Sciences. Nancy Miller, professor of public policy, introduced Sylvia Trent-Adams Ph.D. ’06, public policy, saying she is “committed to public service, research, and improving the quality of healthcare for the most vulnerable populations.” Trent-Adams, who received this year’s award for Outstanding Alumna, Social and Behavioral Sciences, currently serves as the Deputy Surgeon General for the United States, and is a Rear Admiral in the U.S. Public Health Service Commissioned Corps. Earlier this year, she served as the acting U.S. Surgeon General. Trent-Adams said that her passion for helping people, particularly those who are underserved, was one of the reasons that she became a nurse. 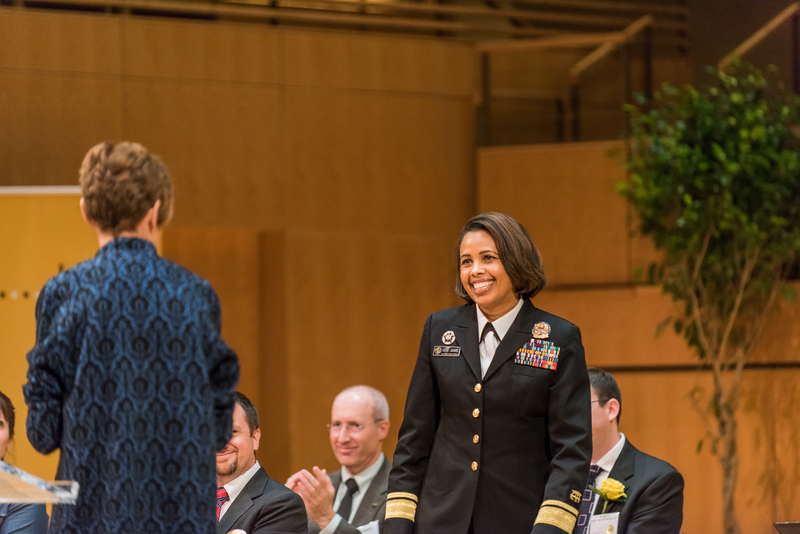 By working with researchers and individuals in the public health industry, she explained that she has grown and pushed herself past the limits she thought she had, and that UMBC provided a framework to think outside the box. 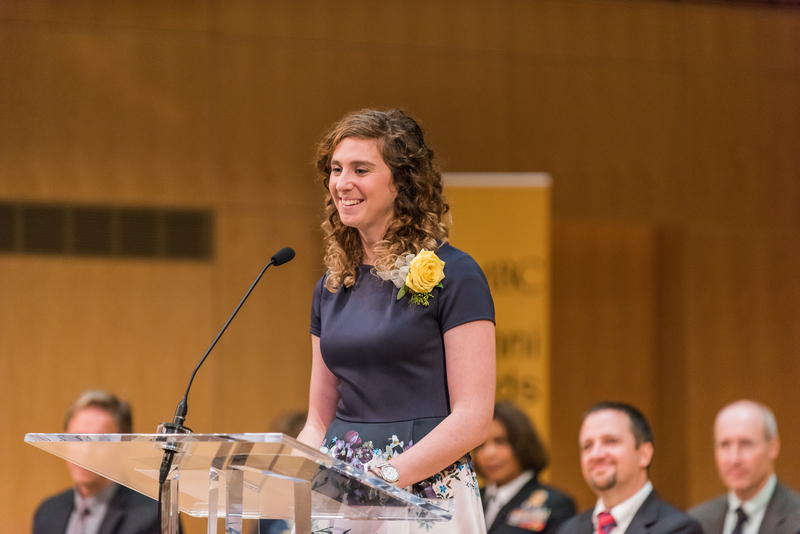 “What UMBC prepared me to do was stretch my knowledge, to put on a different thinking cap about what was possible for a nurse and for a young woman who came from a family with low educational attainment,” she said. Steven Storck ’08, mechanical engineering and mathematics, M.S. ’09, mechanical engineering, Ph.D. ’14, mechanical engineering, received the Distinguished Service award. As a student, Steven Storck ’08, mechanical engineering and mathematics, M.S. ’09, mechanical engineering, Ph.D. ’14, mechanical engineering, was very involved with UMBC’s Baja SAE team, serving as team captain. 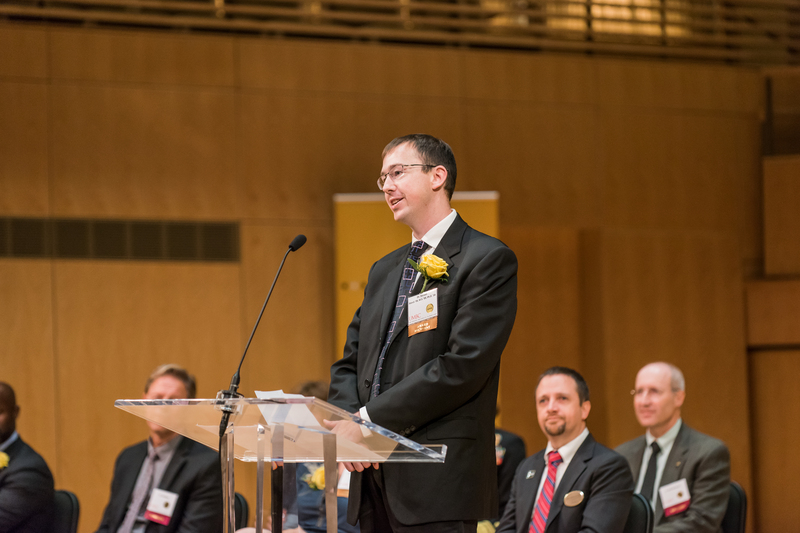 Since graduating, he has led UMBC’s Baja SAE alumni association, said Neil Rothman, professor of practice of mechanical engineering and faculty advisor of the team. Storck, who received the Distinguished Service award, organized the 2015 Baja SAE Maryland event, which brought more than 1,500 students from around the world together in Mechanicsville, Maryland. “His work raised the profile of our university and of our mechanical engineering program, and has given students countless opportunities to develop and showcase their skills,” explained Rothman. Storck, an additive manufacturing application engineer at the Johns Hopkins University Applied Physics Lab, explained how UMBC enables innovation and how people at UMBC are willing to help make your vision a reality. “UMBC is an environment where each individual can leave their fingerprint on the culture, and really change it and shape it and make it their own,” he said. Lauren Mazzoli ’15, computer science and mathematics, M.S. ’17, computer science, accepted the Rising Star award. Lauren Mazzoli ’15, computer science and mathematics, M.S. ’17, computer science, was in the first cohort of UMBC’s Cyber Scholars program and received the 2017 Rising Star award. Cindy Greenwood, assistant director for the Center for Women in Technology, said that Mazzoli is “a role model for our current students in the Cyber Scholars program, and other women in the field.” As the liaison between CWIT programs and Northrop Grumman, Mazzoli has helped coordinate a range of events to strengthen the relationship between UMBC and Northrop Grumman, explained Greenwood. Marc Zupan received the Outstanding Faculty award. The 2017 Outstanding Faculty award was presented to Marc Zupan, associate professor of mechanical engineering. Asynith Palmer ’06, English, who has worked with Zupan to secure funding and design curriculum for the Global Engineering Program, and to infuse elements of the humanities into engineering courses, said she has seen the lengths that Zupan will go to connect students with industry professionals. Six current undergraduate students received scholarships from the UMBC Alumni Association. The scholarships will support Melanie Biddinger ’17, psychology; Matthew Bleakney ’18, mechanical engineering; Jeffrey Carr ’19, interdisciplinary studies; Daniel Gallagher, III ’18, information systems and music technology; Hannah Kiesel ’18, computer science; and Iman Said ’18, psychology, as they pursue internships, research opportunities and a range of courses. Banner image: The 2017 Alumni Award recipients. All photos by Marlayna Demond ’11 for UMBC.